More than 200 people who helped London win the 2012 Olympics have attended a thank you party at Downing Street. Prime Minister Tony Blair hosted the champagne reception - four months after London's historic win. Sporting greats, including Sir Steve Redgrave and Tanni Grey-Thompson, mingled with peers, politicians, press officers and backroom staff. In a speech Mr Blair said "now we have got to deliver the best games the world has ever seen". He said: "People worked with enthusiasm and determination and... it could never have happened without all the people who were working in an extraordinary way. "This reception is a way of saying thank you to you." 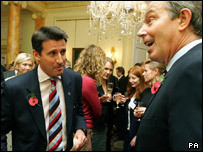 Lord Coe offered strong praise for Mr Blair who jetted out to Singapore to charm International Olympic Committee members ahead of the final vote. He told Mr Blair: "For me the moment I realised it was really possible was about 15 minutes before your plane was about to leave back to the UK for the G8 summit. "We were not complacent. We believed in what we wanted to do and we have achieved it. "We now have something we have achieved which we think is special."